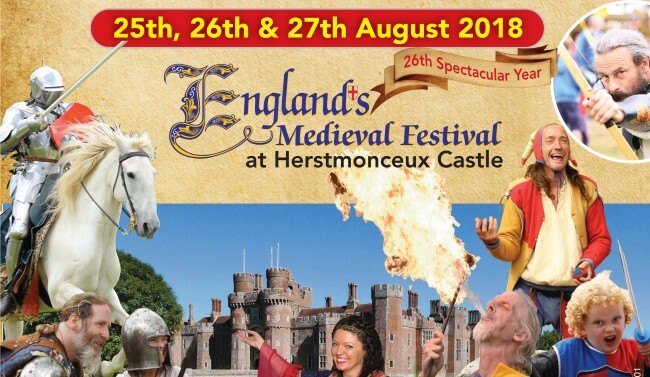 Discover the magic of history and celebrate the past on 24th - 27th August 2018 at Herstmonceux Castle, East Sussex The fairy tale setting of Herstmonceux Castle in Sussex plays host to over 15,000 visitors every August Bank Holiday weekend who immerse themselves in the wonderful sights, sounds and spectacle of England’s Medieval Festival. This hugely popular annual event is the most authentic of its kind in the UK, and an unforgettable, magical weekend experience! Day visitor tickets and weekend camping packages available. From the moment of arrival, visitors step back in time and enjoy an array of dazzling demonstrations, realistic battle re-enactments, thrilling jousting, magnificent grand parades, highly-skilled displays of falconry, music, dance and even a hilarious Mud Show. There’s plenty of opportunity to join the fun too - with have-a-go jousting, archery and axe throwing; sword school; drum school; the Robin Hood Forest adventure area, Princess & Warrior School, plus workshops for all ages, including chainmail, calligraphy, brass rubbing, arrow making, blacksmith-forging and many other traditional arts and crafts. You may even discover a hidden witches circle if you’re lucky! Wizards, jesters, knights, dragons and princesses delight the kids; while the living history village offers the chance to see what it would really have been like to live in the Middle Ages. Traditional musicians join a music line-up of foot-stomping folk bands who party day and night like it’s ‘1499’ at the Buxom Wench Tavern. The 26th anniversary festival welcomes back local lads Noble Jacks and festival favourites, the speed folk masters Perkelt. New for 2018 are the beautifully talented Wild Roses with their multi-instrumental tones, and returning after a five-year absence are Rough Musicke. Their pre 15th century lively medieval music is played on reproduction instruments and combines music traditions and raucous percussion. Real ale, traditional mead and medieval eats are available alongside delicious cuisine for all the family. Thundering drum groups Stix and The Pentacle Drummers return to the show and kids of all ages adore the moonlit cinema showing medieval themed classics in the evening. The 2017 event welcomed several new additions which have now become regular fixtures. The wood-fired luxury spa will be back in a private corner of the festival and the Coracle Society will return to the castle moat. Evening drumming around the community campfire will welcome folk from across the festival and in the woods the Witches Circle will be telling mysterious tales of old. With so much to see and do, many guests opt for camping and medieval glamping, or even the onsite B&B in the magnificent castle grounds. Weekend guests enjoy a sparkling array of evening entertainment, including live music, outdoor cinema, storytelling, medieval stargazing and a magical torch-light parade each night. The camping package is an all-in-one ticket allowing you to camp from the 24th to 28th Aug and enjoy the festival on all three days, from the 25th to 27th August. 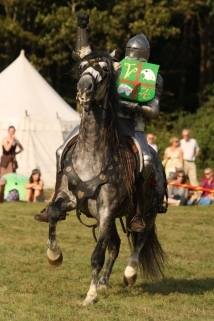 Win a Family Weekend Camping Ticket to England's Medieval Festival! For your chance to win	click here - Competition now closed!